The two of them radically changed the political, spiritual, and cultural life of Egyptians, founding a new religion that worshiped only one god — the life-giving sun deity Aten. Akhenaten acted as the high priest of this new religion, making Nefertiti the high priestess. The famous bust of this beautiful queen (that the white bust in the photo above was modeled after) was discovered amongst drawings, and other art related to the royal family, in the studio of the sculptor Thutmose at Akhetaten — the capital city during her husband's rule. Why is the sculpture of Queen Nefertiti so special? The colors used in painting the piece, the perfect symmetry of her features, and the fact that the bust was discovered in almost perfect condition also made this an unbelievable find for archeologists. Whether or not her beauty was exaggerated is something that can never really be proven definitively, but writing by her subjects referring to her as "Fair of Face" and "Endowed With Love" have been found supporting the artist's vision. 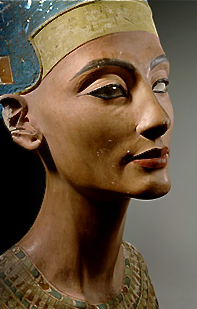 The bust of Queen Nefertiti is located in Room 2.10 of the Staatliche Museen zu Berlin (Egyptian Museum Berlin). Learn more about the most interesting parts of history — subscribe to The Anthrotorian’s Newsletter!